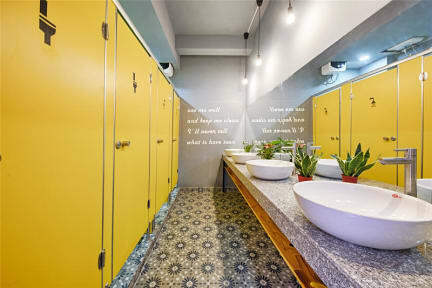 Nang is the first capsule hostel in Da Nang city which have 8 capsules in the female room (on the first floor) and 8 capsules in the male room (on the second floor); size of each capsule bed is 1,2m widex2,2m lenght will be more comfortable than others bed. Especially, the outdoor area on the third floor is ideal for group's party. So, we assure that you will have new experiences with us in this lovely city. After exploring many attractive destinations, you can enjoy your time in big, comfy and really cool Capsule room with safety box, charging point, 2 usb chargers, fantasy background light, reading light, curtain at each Capsule for privacy; and large luggage storage, 02 toilets and 02 showers in the Dorm. And you can use the kitchen to cook your Free breakfast with sandwich/ egg/sausage/ strawberry jam/ peanut butter/,.... and coffee/tea. You can also use bicycle and BBQ equipment for free. In addition, local restaurant and cafe are available in the neighborhood where you can walk to taste the city's cuisines such as Pho, fish-ball noodles, beef rice noodles, pancake, grilled beef noodles, sticky rice with chicken and many vegetarian dishes. Especially, the Han River is just 5-minute walk from the hostel and the city's night view from our balcony is really fantastic.